BGES is honoured to be SOCON’s exclusive partner in providing high-quality sonar surveys to cavern operators across Canada. 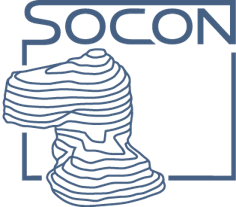 SOCON (Sonar Control Kavernenvermessung GmbH) is a German-based world-renowned specialist in the surveillance of underground caverns. Sonar surveys are commonly performed to determine the geometry of underground caverns. When creating a new cavern, sonar surveys are used to document the development of shape and volume during the wash phase. For storage and disposal caverns, it is important to monitor the change in volume and any possible changes in shapes. Sonar surveying of caverns is based on travel time measurements. It measures the time a sonic signal takes to travel from the survey tool to the cavern wall and back. The distance to the cavern wall is calculated from the measured travel time and the speed of sound in the medium. The acoustic velocity depends on the density, the composition and the characteristics of the medium existing in the cavern, and is determined in-situ using a special tool module. During the development of a new cavern, sonar surveys are used to monitor changes in the shape and volume of the cavity. For operating hydrocarbons storage caverns, it is a mandatory requirement to perform a sonar survey every 5 years under the CSA Z341 standard. For reliable measurements, the sonar tool’s measuring head is often required to be tilted and held in position until a reliable reading is obtained. To ensure accuracy, the SOCON sonar tools are fitted with gyro stabilization mechanism that prevents the tool from rotational, and to orientate the tool during the recording process. A complete sonar survey is conducted by making measurements in numerous horizontal sections over the entire depth of the cavern. The floor, roof and possibly any hidden leach pockets of a cavern are measured with the measuring head in a tilted position.